The iPhones, the Androids, the iPads and hot-spots — whatever the device might be, one thing is for sure: the demand for mobile broadband is continuing to grow unabated. Two different reports, one from Akamai and another from Chetan Sharma show that we are using more mobile data in more places, and this is going to keep changing how we live, work, create and consume. Chetan Sharma, an occasional analyst for GigaOM Pro in his State of Mobile Market 2012 report shares the following stats, that give you a sense of change. Total Global Mobile (non-messaging) data revenues were about $159 billion in 2011. 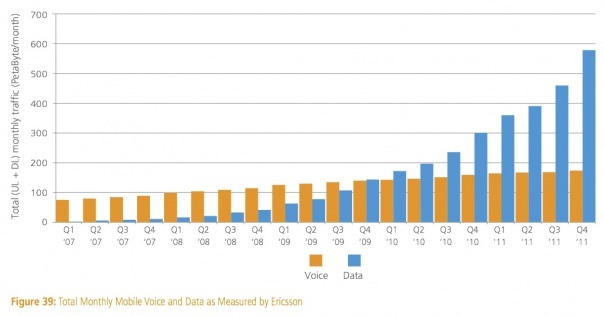 The number of mobile operators with more than $1 Billion in yearly data revenues will touch 50 in 2012. US now accounts for 26 percent of the global data revenues. 70 percent of the device sales in the US are now smartphones. Mobile data will be 95 percent of the global mobile traffic by 2015. In the fourth quarter of 2011, the average measured connection speed for known mobile providers worldwide ranged from a high of slightly more than 5 Mbps to a low of 163 kbps. 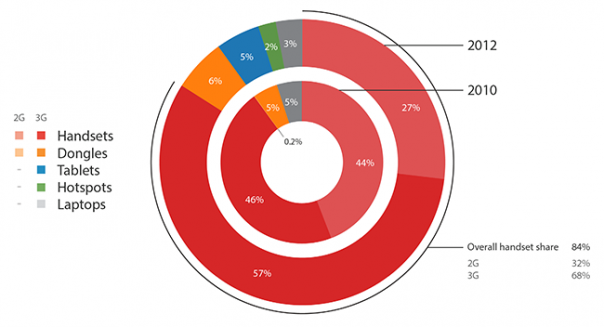 In the fourth quarter of 2011, users at eight of the surveyed mobile providers consumed an average of 1 GB or more per month delivered from the Akamai Intelligent Platform. The volume of mobile data traffic doubled from the fourth quarter of 2010 to the fourth quarter of 2011, and grew 28% between the third and the fourth quarters of 2011. The shift to mobile data is causing quiet upheavals in the industry. For instance, the highly lucrative voice and messaging revenues are vanishing fast, and are being replaced instead by the over-the-top services such as Skype, Nimbuzz, Voxer and other apps such as WhatsApp. As a result of the data tsunami, there are two types of opportunities that are being created, one that takes advantage of the data being generated in a way that enhances the user experience and provides value and the other in technologies that help manage the traffic data that will continue to grow exponentially. So far the carriers are responding to these shifts by experimenting with newer usage plans, and raising prices. But those are short term fixes, for the wireless carriers need to totally re-imagine their value proposition.